Dreadnought was one of the highlights of the show for me. I had never heard of this game before PAX and we wandered by it the first day. I saw gigantic spaceships duking it out in real time action combat and I knew I had to try it. We got into a deceptive line. It looked really long but it moved really fast. Dreadnought is slated to possibly be a spaceship action MMO, but for the moment they were showing off 5v5 deathmatches. After about three minutes of play I was hooked. You control a HUGE lumbering spaceship with crazy amount of firepower. Because of the speed and firepower involved it becomes a game about positioning and strategy, not a game of twitch reflexes. Think about something along the lines of World of Tank or World of Warships... only way more fun... and with awesome spaceships... and no permadeath. I loved this game so much that I went through the line three more times during the course of PAX, even with all the other amazing games on the show floor. I'm really looking forward to this one, even though it probably won't be out for at least a year. 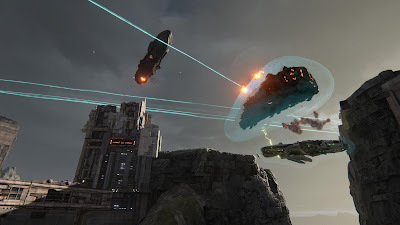 Keep Dreadnought on your radar. I loved this game so much. I'm excited to see how the end product turns out.